Complementary pet food for cats and kittens over 6 weeks old. Whiskas® Cat Milk has a great taste your cat will love! It a healthier alternative for cats and kittens, developed by top nutritionists which contains less than 0.2% lactose. This ensures your feline friend won't have stomach any problems because Whiskas® Cat Milk contains low lactose compared to cow's milk. Balanced mineral levels to treat your cat to all the best stuff they need, like calcium, fibre and protein. Free from any artificial colours, flavours or preservatives. 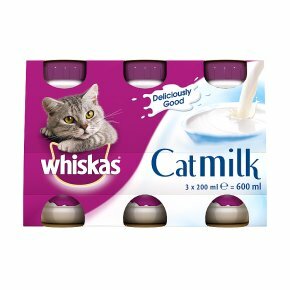 Whiskas® Cat Milk is specially made with reduced lactose so that it is good for indoor domestic cats. Unlike regular milk it has been specially developed by top nutritionists and veterinarians to contain less than 0.2% lactose. Cats love the yummy taste of Whiskas® Cat Milk and because it contains calcium and vitamins every lap is full of goodness. Whiskas® Cat Milk - Deliciously Good. Easy addition to everyday feeding routines. Feeding instructions: Feed up to 1 bottle per week. Please reduce main meal accordingly. Shake well before use.